Round up of the first week back. I tried to sit down and write something yesterday but all I had in my head were grumps, moaning and anger. I thought it might not be such a helpful reflection on the week to write in that state. It was a funny week. Husbandface had the first day back off work, son1 had an inset day with nursery and it wasn’t really the plunge back into routine we had all craved. Tuesday and Wednesday morning went more in the normal vein of things and then son1 was very sick and life took an interesting turn. Thursday we managed an awesome quiet day with lots of screen time, Lego time, extended nap times all round and lots of opportunity to sort things in the house for me. Very helpful. A veil is best drawn over Friday. Hormones, anger, illness and overexcitement/concern about family arriving from son1 led to a whole heap of bad choices from us all, many tears, lots of Tractor Ted and many apologies all round. Last night I could still see nothing good in the world beyond the glass of wine and peanut butter sandwich comforts in my hand. Thankfully some sleep, some fun playing with the boys in the early hours of this morning, fresh air, seaside beauty and really good times with family have meant my brain has settled down a bit. Life no longer seems so laden with doom. It’s been great to hang out with the in laws and nephew today. Other people around being extra pairs of hands with the boys is most welcome in these intense times. Husbandface is on the edge of sanity lots at the moment and it’s good to share the load of life. 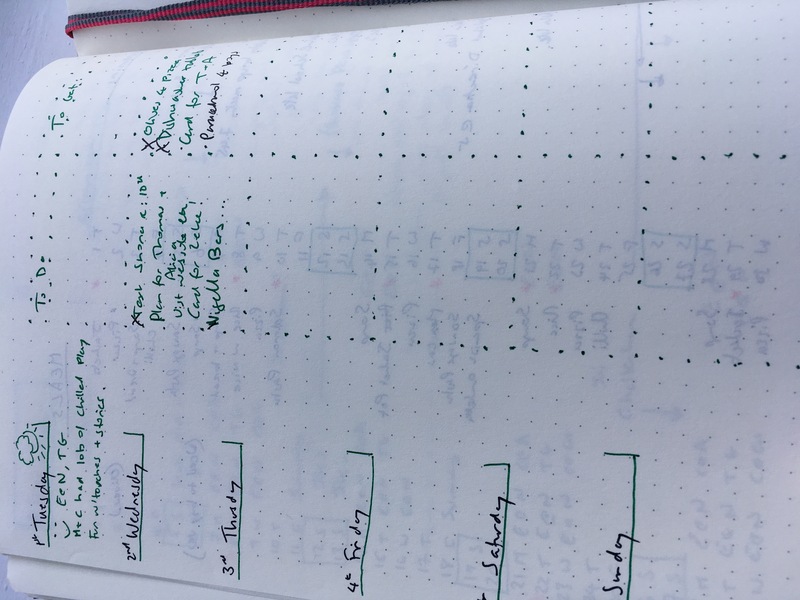 The best thing about this week has been the start of my new bullet journal. Google it if you want an explanation clearer than mine. Fundamentally it’s a place to collate all planning for life, to do lists, monthly events, weekly tasks, creative thoughts, menu planning and whatever else I feel like putting in it. I only discovered it was a thing when husbandface started doing it earlier in the year. It revolutionised his work planning and involvement in home life. It now functions as his brain and I’ve been lured in. I love that it’s pen on paper, anything to get me away from the phone. I love that it’s totally customisable. I love that even though the internet is full of totally beautiful ones I am very happy with my scraggy lists and crossed out mumblings. I’ve wanted some way to organise my life for a while and this helps me do it in a way that apps on the phone simply can’t manage. Also it’s bright pink, shiny and has numbered pages for ease of finding things with a contents page. All in all very satisfying. Oh and we laminated leaves. Seriously. So much fun, very quick and with awesomely beautiful results. 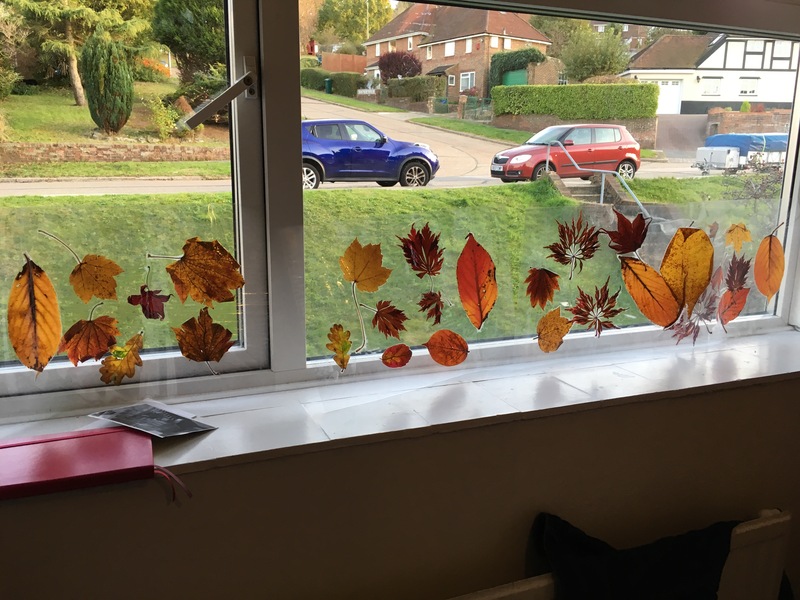 I thought the leaves had lost their shiny colours from when we collected them last weekend but they just needed sunlight streaming through them again to light them up. Genius. Leaves are really the only craft thing I can bring myself to get excited by. I love autumn and it’s good to get into the beauty of this time of year with the small ones.